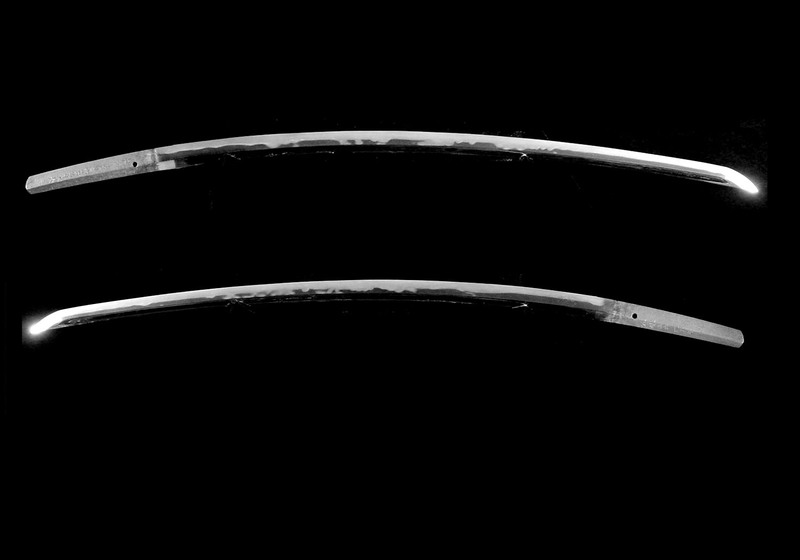 It is with great pleasure that I am able to offer this wonderful katana from the Muromachi era. Nagamitsu worked in Osafune during the Eiroku era (circa 1558). He is a Jo-saku rated smith in Fujishiro and is a Jûyô rated smith. 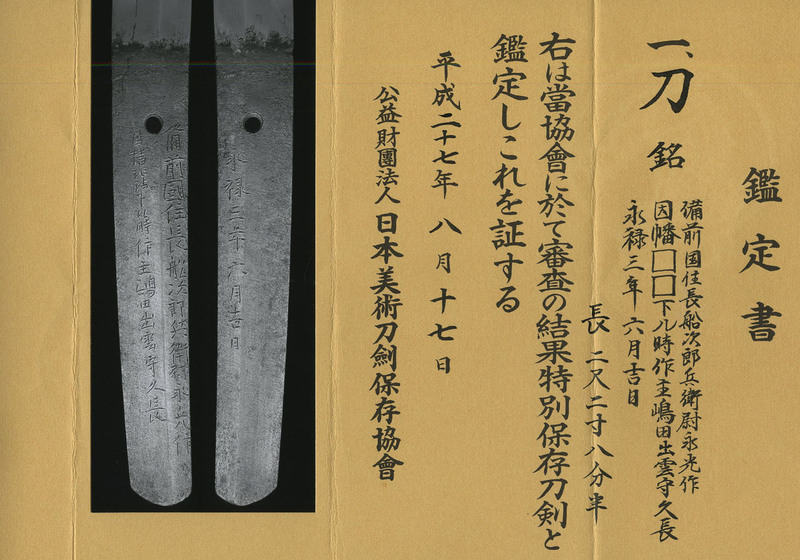 This particular blade is dated as being made in the third year of Eiroku (1560). At a glance it resembles the workmanship of Sukesada or Kiyomitsu. 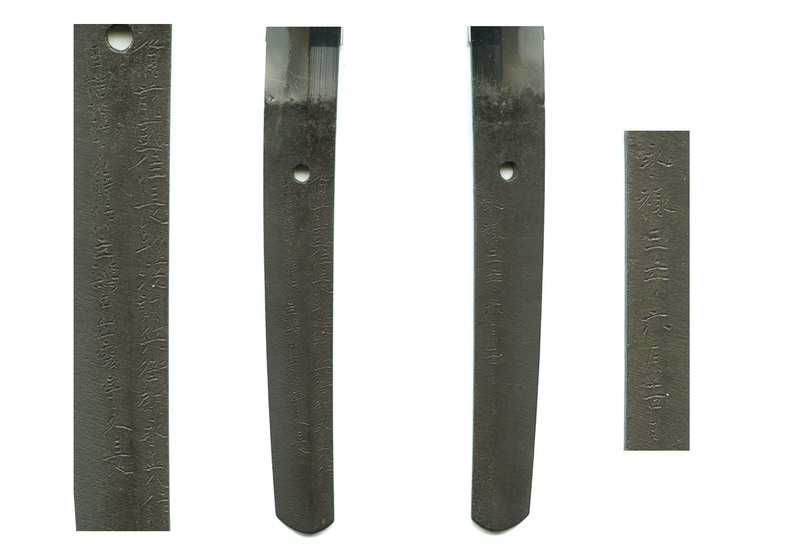 Unlike the earlier Sue-Kotô (late Kotô) blades of circa Meiô to Eishô (1492-1521) when the average lengths are around two shaku, one-sun (25 inches), blades dating to Eiroku such as this blade tend to have lengths of around two-shaku, three-sun. This change in length is generally attributed to the increased pace in fighting. 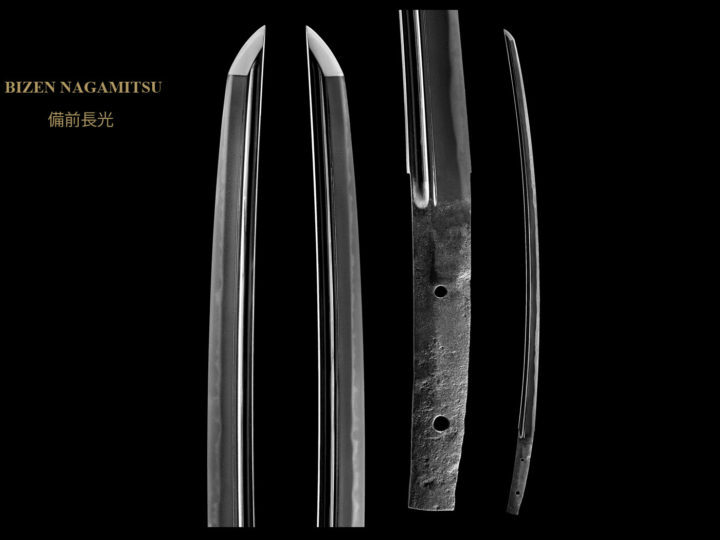 For example, in 1560 when this blade was made, the Imagawa were defeated by Oda Nobunaga and the country was at the height of the Sengoku period of constant warfare. In keeping with these changes, this blade has a cutting edge of 27.25 inches or 69.2 cm. 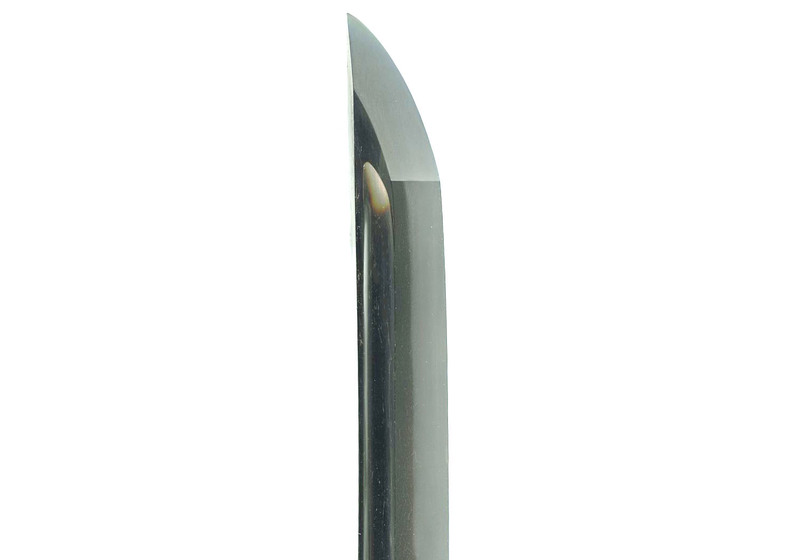 It is a wide and powerful blade with a moto-haba of 1.16 inches or 2.9 cm and a saki-haba of 0.88 inches or 2.2 cm. 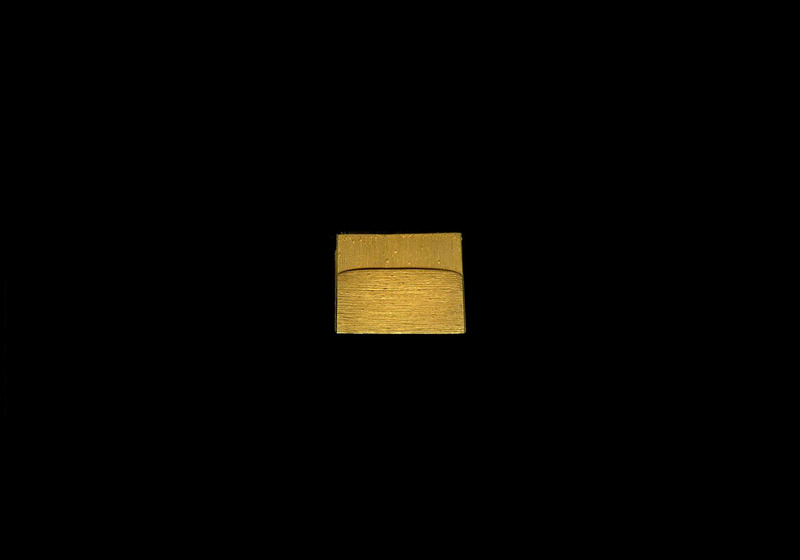 It has a deep koshi-sori of 1.03 inches or 2.6 cm. There are bô-hi on both sides ending in maru-dome (round shape) just above the habaki. 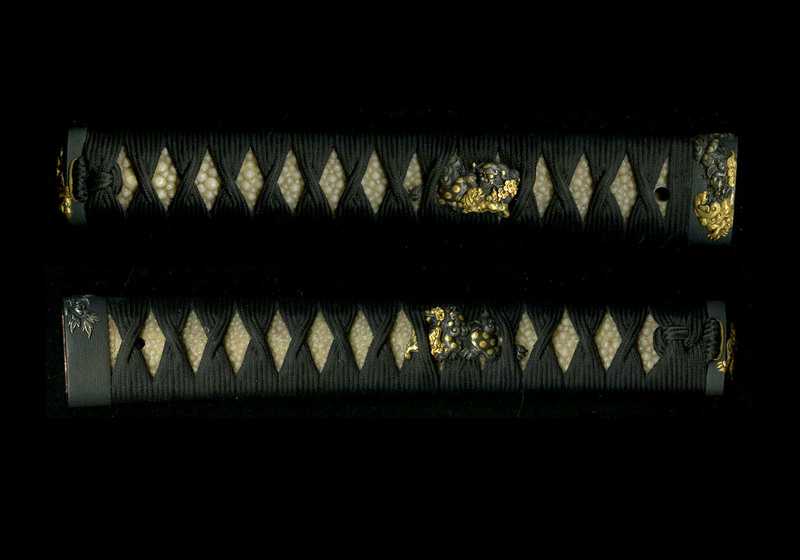 The jigane of this sword is typical Bizen with a mixture of ko-itame and mokume that is well worked and covered in minute ji-nie. The hamon starts at the yokote in a wide suguha form with a few areas of small midare. As it proceeds down the blade toward the nakago, it becomes a wild and flamboyant gunome-midare that reaches the shinogi in areas on both sides. The habuchi is covered in ko-nie and the yô are highly active. 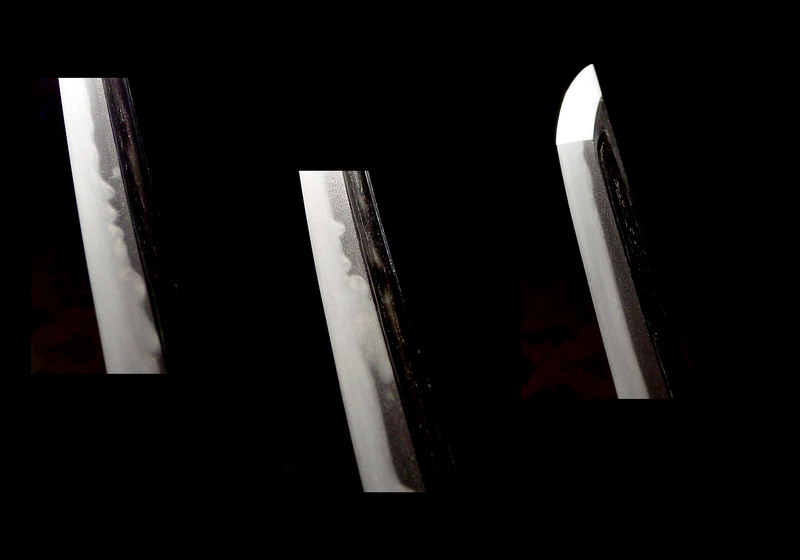 There is some feint utsuri especially in the bottom half of the blade along the shinogi. 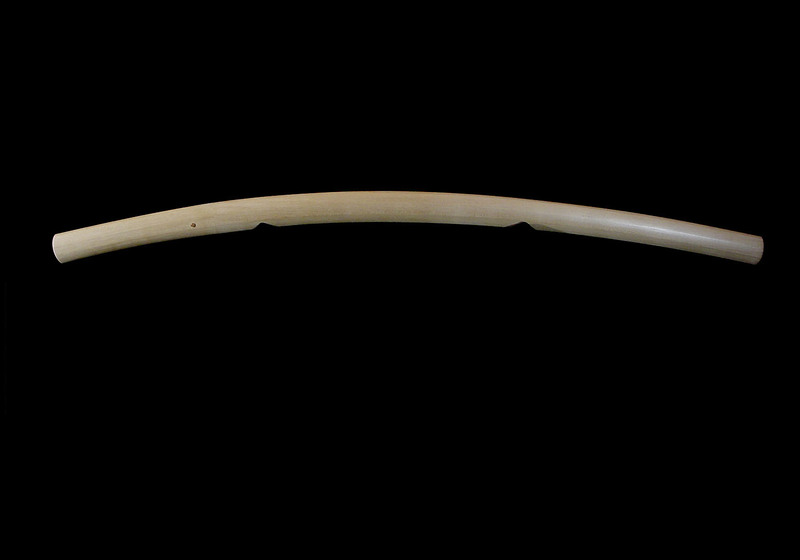 The bôshi is stretched which is indicative of this era of production in Bizen and is almost ichi-mai on both sides. There is some hakkikake activity within the bôshi. There is a ko-maru tip and short kaeri. 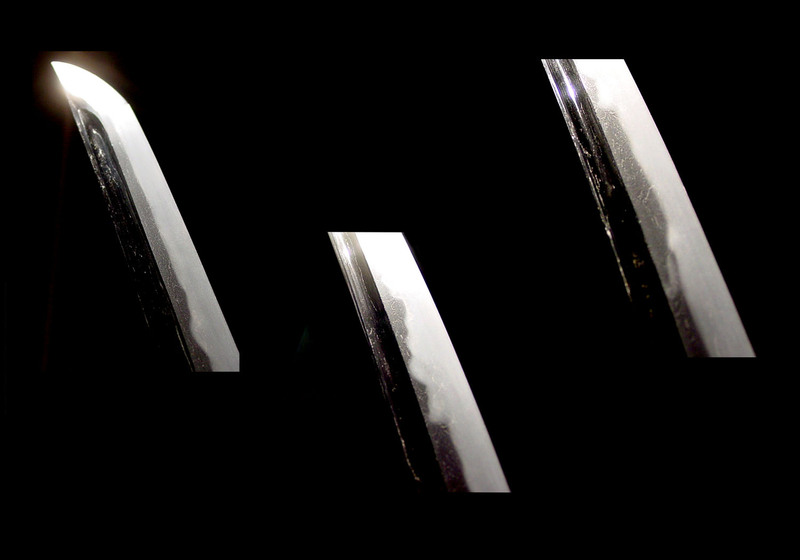 As one sometimes finds with a blade from this era, that are the remnants of some sword strikes on the lower third of the mune. They have been mostly removed by polishing, but they are still evident. The first line is the name of the swordsmith, Jirobei-no-Jo Nagamitsu. The second line translates as, “Ordered by Shimada Izumi-no-kami Hisanaga as he was returning to his home in Inaba (Tottori Prefecture)”. The two squares in the mei represent two kanji characters naming the town in Inaba. It must have been a small town because no one seems to be able to read these kanji (you will see the same two squares on the NBTHK papers). This translates as the date of forging, i.e. “A lucky day in June of 1560”. This blade comes with a fantastic koshirae. The saya is black lacquer and is in pristine condition. 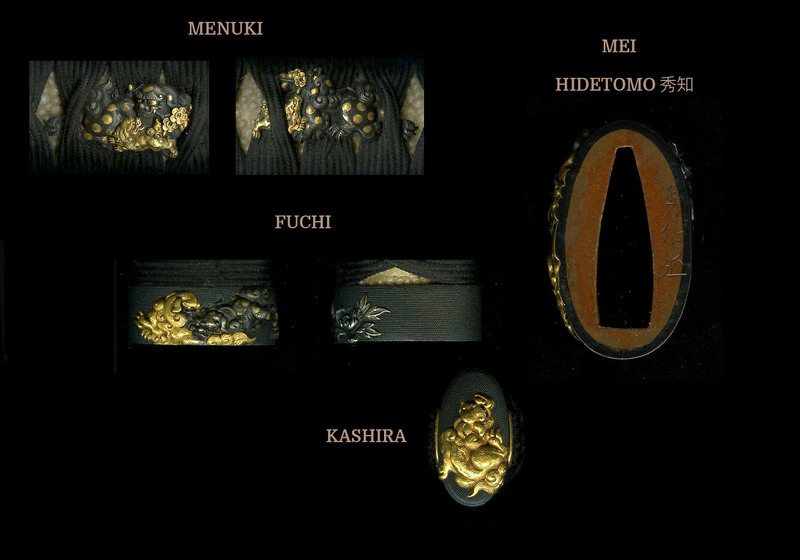 The fuchi, kashira, and menuki are signed Hidetomo (kao). Hidetomo worked in the mid-1600’s and was a student of Omori Teruhide. The quality is superb and consists of shishi lion-dogs done in extremely high relief in shakudo and gold. 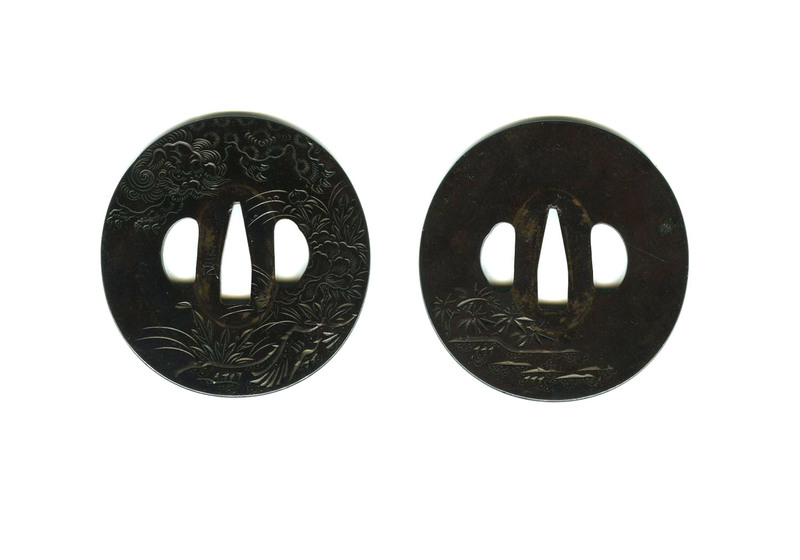 The tsuba is of shibuichi and is delicately carved in kebori style depicting a shishi also. 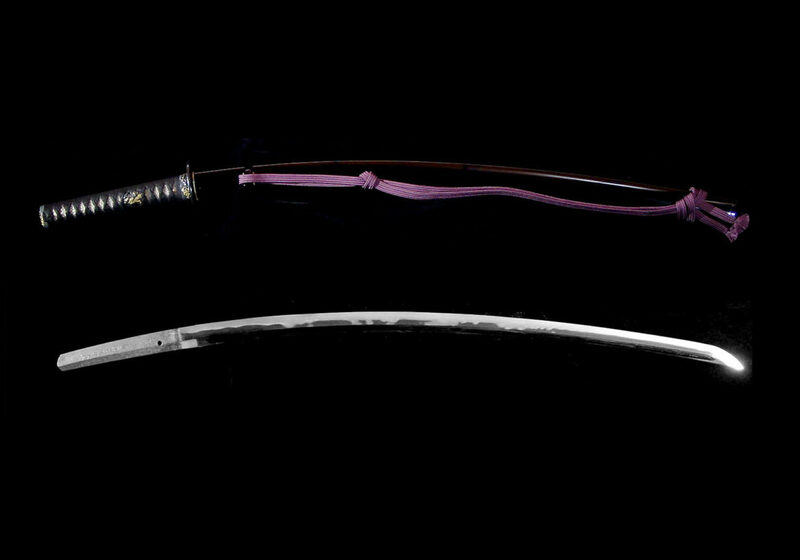 The blade comes with NBTHK Tokubetsu Hozon papers attesting to its authenticity and quality. 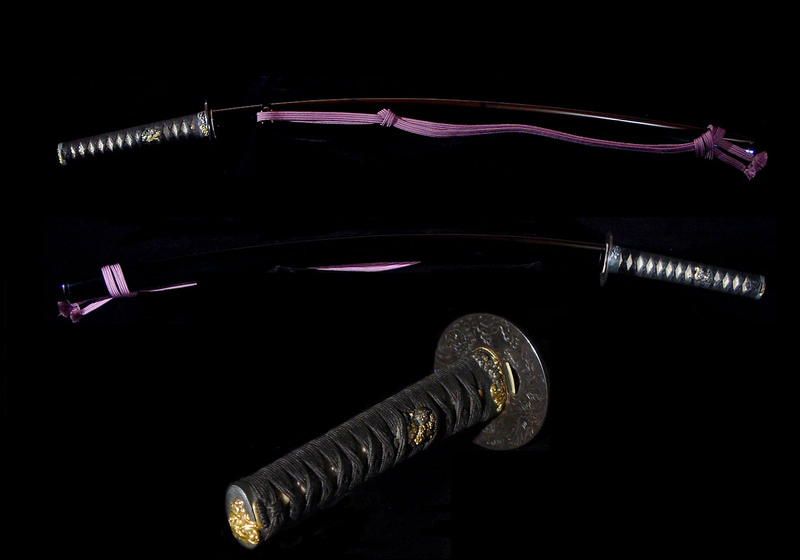 This is a fantastic katana from an exciting period of Japanese history. It has been wonderfully preserved.